I got back a few days ago from my annual road trip with the guys to spring training in Phoenix loaded with images taken along the way. In usual form, I was planning on holding off the images for one big post but I had this one that I had to spit out as soon as possible. Our trip started in the SF Bay Area but we figured a brief pit stop in Vegas as good as any to relax, feed and refuel. Since I was driving, I made sure that we stopped at the Hoover Dam. Never mind that it was 1am, I had wanted to see this place for years and had to grab a shot. Image Info: Shot with the intention of becoming an HDR image, I later decided to process this auto-bracketed image using exposure blending (or fusion) in Photomatix. Further cleanup and hand blending was done in Photoshop CS4 and final adjustments in Lightroom. I shot this image on a tripod with my Canon 5d mkII through a Canon 16-35mm @ 16mm/f4.5 for a base exposure of 8 seconds using ISO 320. Spring Training Road Trip Vacation to Hearst Castle Welcome Home Seeing Griffith at Night in HDR Night Image of the New San Francisco-Oakland Bay Bridge! 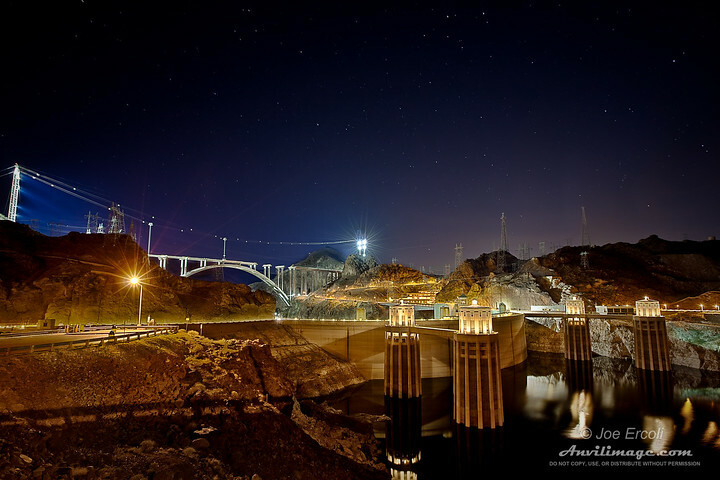 This entry was posted on Thursday, March 11th, 2010 at 2:24 pm	and is filed under Blog, Photos and tagged with arizona, Hoover Dam, lake, nevada, night, road trip. You can follow any responses to this entry through the RSS 2.0 feed.